Do you need extra help for EL students? Try the Short Vowel Word FamiliesPre-lesson. Students will be able to identify and spell words in the -and family. 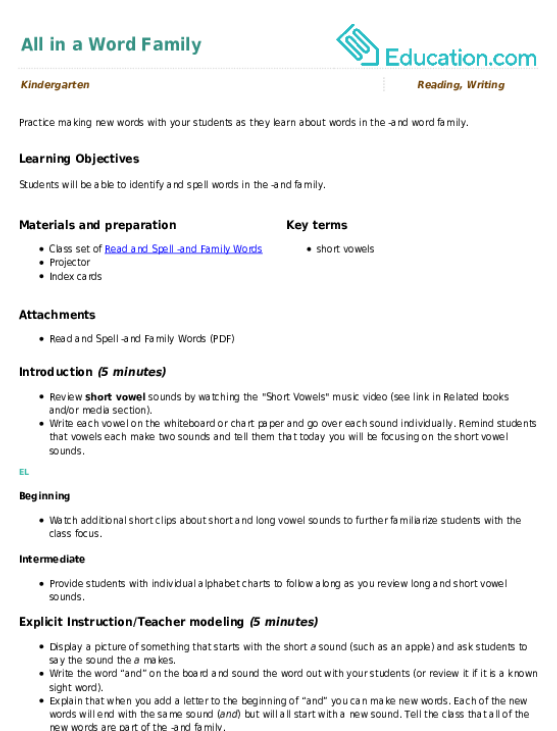 Review Short vowel Sounds by watching the "Short Vowels" music video (see link in Related books and/or media section). Write each vowel on the whiteboard or chart paper and go over each sound individually. Remind students that vowels each make two sounds and tell them that today you will be focusing on the short vowel sounds. Beginning:Watch additional short clips about short and long vowel sounds to further familiarize students with the class focus. Intermediate:Provide students individual alphabet charts to follow along as you review long and short vowel sounds. Display a picture of something that starts with the short ASound (such as an apple) and ask students to say the sound the A Makes. Write the word “and” on the board and sound the word out with your students (or review it if it is a known sight word). Explain that when you add a letter to the beginning of “and” you can make new words. Each of the new words will end with the same sound (And) but will all start with a new sound. Tell the class that all of the new words are part of the -and family. Demonstrate putting a new letter in front of “and” and reading it aloud. Beginning:Use images (drawings or pictures) to demonstrate changing the first letter in the word to create new words. For example, add an S and the word becomes "sand." Intermediate:Have students practise repeating the new words aloud after you read them. Create a class chart titled “-and Family.” Have students share with a partner to add words to the chart. Encourage students to think of blends to make additional -and family words, such as Br, Gr,Etc. Add the new words to your chart. Students can write each word on an index card and then tape the words to the chart. If you are short on time you can write them directly on the chart. Use the new words in a silly poem or short story. Beginning:Provide additional images for students to reference when sharing -and words with their partner. Allow students to draw pictures of or write their new -and words on index cards. Have students identify the new -and words in the song or story by giving a thumbs up when they hear an -and word. 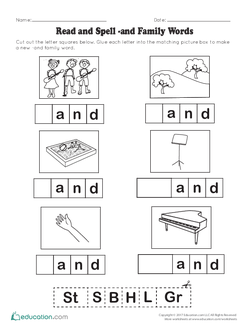 Pass out the Read and Spell -and Family Words worksheet and have the students complete it independently. Work with individual students as needed. Beginning:Check that students are familiar with the images on the worksheet. Intermediate:Provide opportunities for students to turn and talk to share their new words with a partner. Provide students with index cards and have them copy the -and family words from the class chart. Have students illustrate each index card and then practise reading each word. Enrichment:For advanced students, have them create their own -and family story using the words from the worksheet and class chart. Have students read one of the -and family words from the worksheet or class chart as an exit task. Check student worksheets to ensure that they were able to spell each of the and family words correctly. Informally assess student understanding by checking in with students during the individual work time. Have students share one of their -and words with a partner. Provide sentence strips for students to use one of the -and words in a new sentence. Pair students up with a partner to share their sentences. Remind the students how to read the -and family words and celebrate their ability to read and spell more words. Demonstrate how to change an -and family word (by changing the first letter) and have a few students share a sentence they could use the word in. Beginning:* Review the word family concept using another word family, -in or -at. Intermediate:Have students share their sentences with the class if time allows. Check out the -in word family by sliding from consonant to consonant to create three-letter words your child can practise sounding out. Zip and dip in time to the "ip" word family. Use this word slider for rhyming and reading, along with the other word family sliders. This eg word family cut and paste activity helps kids learn how to build new words by adding letters. They'll learn rhyming words from the -eg word family. You can see a lot in the "ot" word family! Make up to eight rhyming words with this word slider that your child can practise reading and saying. This "ed" word family slider includes some known and new rhyming words. Give your kindergartener some rhyming and vocabulary practise with this word family worksheet. Here your child learns to rhyme words from the -ell word family! Here are a few words to go "un" about. Check out some of the -un word family. Take a peek at part of the "ad" word family. Help your child practise sounding out letters and word sounds for stronger reading skills down the road. The "ap" word family includes great words, like map and zap! Help your child get to know these fun words and letter sounds better with a word slider.